During times in my life, I have found ease and in a way happiness through music. I tend to get obsessed with specific bands and listen to them non-stop until I discover a new one. When listening to a new song, melody is what catches my attention at first, but lyrics are those that will make my mind stuck on it (and even sometimes dream of it). Last year it was The Beatles (and it still is), then it was Coldplay and currently (or to be more precise for the past 6 months), it’s been Tame Impala. It is an Australian band, introduced to me by my sister and it goes perfectly with my addiction for the land down under! So if you were to listen to my playlist that would be their two latest albums, Lonerism and Innerspeaker, and if I had to choose for my favourite one, that would be the latest. I strongly believe they are a newest version of Pink Floyd or even The Beatles, with a 21st century twist. 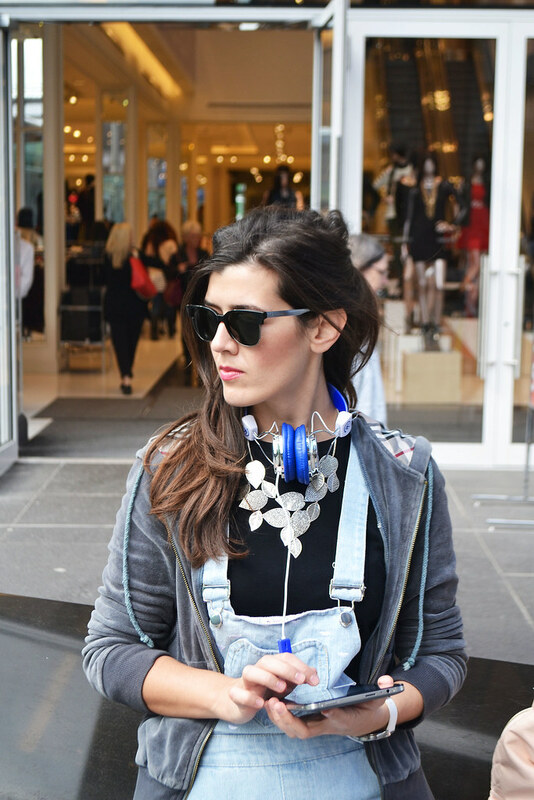 Walking down the city centre, listening to my favourite band, my essential accessories are over the head headphones and my tablet. Dungarees are optional but I think they did great with the whole urban style look. What do you think?Any great bands that I am mising (always eager to learn)!